This is a selected listing of sundials in the North American Sundial Society Registry. Click on any dial thumbnail picture or city name to display the full dial description with additional information and images. Copper armillary dial 18 inches diameter. Two main rings are square1/2 inch tubing. Other parts of armillary are made of flat copper, about 3/4 inch wide. Has Roman numerals. Probably built by Ferguson family and installed in the 1920's. The dial base is cast cement, partly fluted, about 3-1/2 foot high, round at top, square at bottom. A beautiful and well preserved vertical dial 40 x 40 inches. The sundial is on the southerly facing wall of Albany City Hall's 202 foot carillon tower, a building on the National Historic Register. The dial is marked with lines every 15 minutes; the hour lines are marked in roman numerals extending from XII in the morning to XII at night. Although the dial is in excellent condition, the gnomon is slightly bent. There is a small "signature" on the lower boarder of the brass plate, "Haight and Clark, Albany NY". Side note: The tower houses the first municipal carillon in the US (1927). 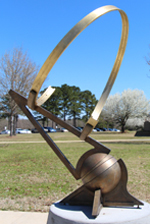 A vertical "Icarus Sundial" of bronze, copper and ceramic 86 inch high x 48 inch wide on a 30 inch high pedestal in front of the Explora science museum. The gnomon depicts Icarus falling; the back side depicts Icarus ascending toward the sun. The pedestal is placed within a 20 foot concrete circle showing a labyrinth defined by a sandblasted path of feathers. This painted vertical dial is 10 x 11 feet, covering a vast expanse of south facing wall. The dial has a strong New Mexico theme using bright colors, and many personal elements. There is a road runner, hot air balloon, a lunar footprint (centered at 2:18 (clock time) on July 20th 1969, the minute they landed). There is a red, white & blue star at the 11th hour of the 11th day of the 11th month for Veterans Day. In the night exposure of the sundial the star Polaris is just above the gnomon, as it should always be. All the little embedded details in the sundial are explained on the ‘Details’ tab of the website link below. A 36 inch diameter brass and copper horizontal sundial with a gnomon depicting a bird standing and a bird in flight. The bird motif reminds of "The Bird of Time has but a little way to fly--and Lo! the bird is on the Wing" by Omar Khayyam. The gnomon is buttressed for strength and includes a brass ball at the top as a safety feature in light of a nearby middle school. An 8x36 inch polar noon meridian dial of wood and steel pipe. The dial face is inclined at the latitude angle and the shadow-casting 36-inch gnomon pole is perpendicular to the dial face, pointing at the local meridian on the celestial equator. The gnomon pole shadow shows the declination of the sun, with the shadow extending below the gnomon in spring and summer, and above the gnomon in fall and winter. Short rods at the tip of the gnomon cast a cross-shaped shadow on the dial face, marking the date on the nail head analemma on the dial face. At local noon the gnomon shadow is vertical; the face and gnomon size are selected to allow the shadow to always fall on the dial face at noon throughout the year. On the equinoxes, the cross shadow bisects the gnomon base. This dial is on private property but may be seen from the public sidewalk. For closer inspection, the owner may be contacted. 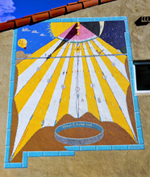 This was a unique horizontal sundial designed for the Nob Hill Main Street program, where the sundial anchored the southeast corner of the Nob Hill Community Garden. Created several years ago by Mike Heighway and Mira Rose, Mike explained, "The purpose of the Nob Hill Sundial is to act as an interactive gardener’s guide. It works on an annual cycle by casting a shadow from a large center piece (the gnomon) onto a concrete plate with embedded steel [diurnal] bands and porcelain tiles that describe that month’s gardening activities." The dial itself was about 10 feet in diameter with an metal, rust-colored gnomon. The sundial is designed around the summer and winter solstice, since these are ultimately the times of year when the sun is either at its highest or lowest point in the noon sky. Each horizontal band connects to two tiles; one side for months approaching the summer solstice, and the other for months approaching the winter solstice. The tiles instruct people what monthly activities to do in the garden. A carved vertical dial approximately 46x41 inch, probably of sandstone, placed about 13 feet above street level. Dial face declines 22° W.
A bronze horizontal dial on a hexagonal pedestal. Gnomon angle measures 31.9°, wrong for local latitude. Gnomon is aligned southwest rather than true north. Dial sits in a former fountain installed in 1896. The Centennial Time Tower begins as a tetrahedron of stainless steel pipes each 18 feet long. Then a central pipe towers to the sky, giving an overall height of about 50 feet. The Time Tower is situated on a circle about 100 feet in diameter. The dial was erected for the hundredth anniversary of the discovery of Helium. Each individual pipe is a time capsule filled with helium. The plaque under the center of the tower shows when each one is to be opened. In the garden of Old Economy Village is a 1964 reproduction of the historic 1825 original keep safety indoors. The 9-inch stone dial has four vertical dials on the E,W, N and S sides and one horizontal dial on top. The replica is in fair shape where the engraved hour lines are now severely weathered. The replica five iron gnomons are in fair condition, but still tell reasonably accurate local solar time. Each dial is delineated in half-hour marks with the hours shown in Arabic numbers. On the fields of U-Mass is a replica of an American Indian sun-wheel. A circle 130 feet in diameter has 14 major stones weighing 56 tons, 12 minor stones, and 4 flat stones at the center. 2 major stones mark the N and S cardinal points; a pair of portal stones mark the E and W points allowing an uninterrupted view of sunrise and sunset at the equinoxes; 4 stones mark sunrise and sunset at the solstices; and 4 more stones mark the extreme northern and southern positions of moonrise and moonset. Guided presentations can be arranged by calling 413-545-4311. A Centennial Dial for Amherst, this is a square horizontal dial with clean design about 18 x 18 inches. 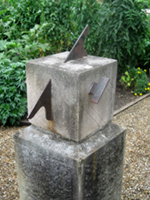 The dial face and triangular gnomon are cast bronze sitting upon a granite pedestal. The dial has hour lines and Roman numerals from IIII (morning) to VIII (evening) and tick marks for the quarter hours. An accompanying display explains the function of the sundial and contains a table for the Equation of Time, including longitudinal correction. 4'x8' Marine Plywood & Aluminum Gnomon and struts made of copper plumbing pipe. Refurbished by Threat in 1992. This dial is one of Bill Gottesman's uniquely designed Renaissance dials of cast and structural bronze with a 27 inch diameter time telling helix whose axis is aligned to the celestial-north pole. Time is told by a focused beam of light from a long cylindrical unsilvered mirror situated on that N-S axis, reflecting sunlight into a slit of light onto the helix, telling time throughout the day. A sliding time scale within the helix is adjusted for longitude, date's equation of time correction and daylight saving time. Once this scale is adjusted for date, the dial shows civil (local clock) time with an accuracy of under one minute. The dial base is cast bronze that allows adjustment for latitude and is placed on a sandstone plinth. A very large and ornate armillary sphere, approximately 8 feet in diameter. Sculpted by Paul Manship in 1928 and cast by Alexis Rudier Fondeur in Paris. The armillary has large figures inside the sphere at the base and the equatorial circle has signs of the zodiac in raised metalwork. The dial sits atop a well proportioned light granite pillar that is about 3 foot high and 4 foot diameter. Large equatorial dial, with gnomon in the shape of a treble clef sign. Approximately 4 foot across. Dedicated to founders of Sigma Alpha Iota international music fraternity for women. Dial sits atop a tapered cylinder 3 ft high. A 6 foot square weathering steel horizontal dial with a 3 foot high thick welded steel gnomon. Hour lines are welded steel strips. No hour numerals are present. A three foot wide brass and steel armillary of complex design with many features. Gift of Albina du Bolsrouvray. Markings are in French. This dial is reported stolen in mid-2011. A painted steel on building brick vertical dial with a 6 foot gnomon. Gnomon includes decoration of two children and a gear wheel. Hour markings are Roman numerals.